The farmer of April, stands firmly upright, having a clear view of the ‘Potential’ of the healthy leaves, and the lack of life of the wilted leaves. His calmness, his straight body, his self confidence, make him look to my eyes like the Charioteer of Delphi, an ancient statue, whose sight has always been exercising a powerful magnetic force to my attention. When I first met the Charioteer, I almost fell in love with him. An impulse to be like him, to reach the state of his consciousness, to arrive at an internal Place where I can Be, like he is. The Charioteer is neither Male nor Female. He has the powers of both archetypes. He stands calm, serene, in his beauty, holding the reins of moving horses. He is moving and still at the same time. He has full control of the chariot, but he is not affected by any externality. He has the ability of a constant connection with an internal source of deep emotions and inspiring thoughts , filtering out the noise of the outer world. I have an original copy of the bust of the statue, at home, in my sitting room. He is always there, to remind me that my chief feature, the ‘Good girl and beggar of acceptance’, cannot have any connection with that internal source. When taken over by this group of ‘Is’, the connection is only with a source of external signals, saying to me ‘I approve you’, ‘I don’t approve you’, ‘I like you’, ‘I don’t like you, ‘You deserve my attention’, ‘You don’t deserve my attention’. Then, a very sensitive receiver, can detect all these subtle signals, transmitted by a look, a grimace or a nod coming out from another person. I have noticed, that the more I appreciate that person, the more sensitive is my receiver. These days, I am watching my dialogues with a colleague of mine, whom I highly appreciate. He is team leader of one of the teams of the business unit I direct. I presented him the idea of expanding our functions into a new area. He was very negative, considering this new venture, very difficult and risky for the reputation of the company. I saw his angry and disappointed face. Ι felt in my stomach, a ‘hook’, attached to his negative look. Waves of negative energy, were transmitted to me via that hook. I lost myself… A voice in my head, kept telling me ‘You are not a good director, you cannot make correct judgments as to the true business risks and opportunities’, ‘The former director, did it better than you’, ‘The team leader thinks you don’t deserve to be his director’. The team leader left my office, and I was left emotionally dismantled. I realized what had happened, and decided, next day, to be prepared for a better encounter with him. Indeed, next day, when he sat in front of my desk, I tried to feed a different ‘hook’. The ‘hook’ onto my inner sensation, not the ‘hook’ onto his emotions. We started talking about the critical subject. I watched him going negative again. But I just watched him, without being affected by his grimaces. I felt compassion to his fears. Speaking slowly allowed me to preserve my divided attention, half to my ‘center’, half to the actual problem. I knew that the only way to take a correct business decision, was to focus on the problem, analyze all its parameters, and assign some specific tasks. I had a deep trust, that if I give enough time to investigate this opportunity, the correct decision would come out naturally. The team leader left my office, still negative, but I felt a sense of freedom. I was freed from the ‘beggar of acceptance’, from the sensitive receiver, from the ‘hook’ to the other’s emotions. This freedom made me more compassionate, because I could feel how my colleague felt, without the noise of the ‘judging voices’. Looking back at this experience, I am wandering, how did I manage to break that ‘hook’ felt in my stomach? Maybe because the divided attention in two directions, doesn’t allow a third direction. Maybe because there is someone in me, who already has many similarities with the Charioteer, someone who has a deep conviction that every person is of value, no matter his capacities and talents. Someone in me who feels safe, no matter the external conditions. 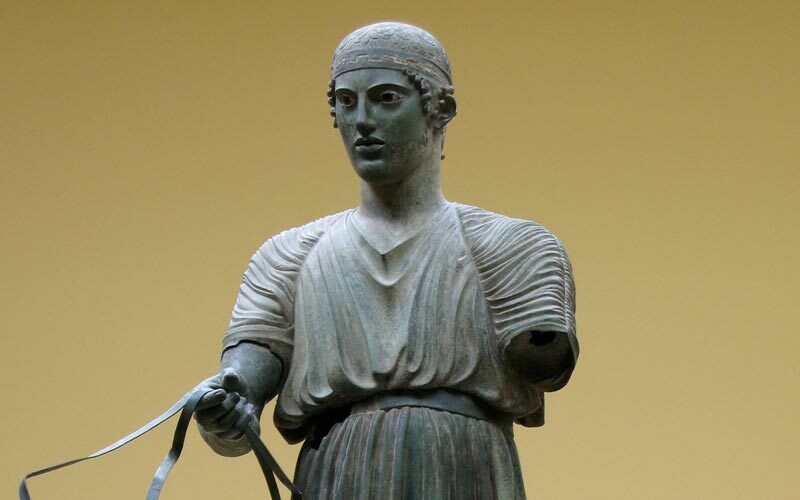 My Charioteer, standing upright, calm, and beautiful, inspires my internal farmer, who seeks for healthy leaves… Now I know that these leaves are often hidden behind ‘hooks’ that have to be removed.